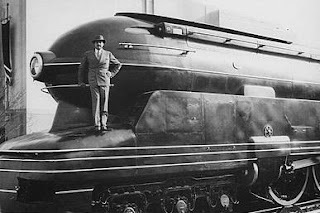 Our gratitude to Nag on the Lake for introducing us to the Franco-American industrial design pioneer Raymond Loewy whose multidisciplinary vision informs a magnitude of iconic brands and defining how form follows function. Among his contributions are the interior of the Boeing Stratoliner, various locomotives, coaches, the Sears Coldspot refrigerator, the Schick electric razor, the Lincoln Continental, a jukebox, a version of the Coca-Cola bottle and the Coke can, Lucky Strikes cigarette packaging, subway cars plus the interior and living space of Skylab and the Concorde. Additionally, Loewy created logos for TWA, SPAR, Exxon, Shell and many others. Go over to Nag on the Lake at the link up top to see an insightful 1979 CBS television interview with Loewy, dubbed by the press as the Man who Shaped America.